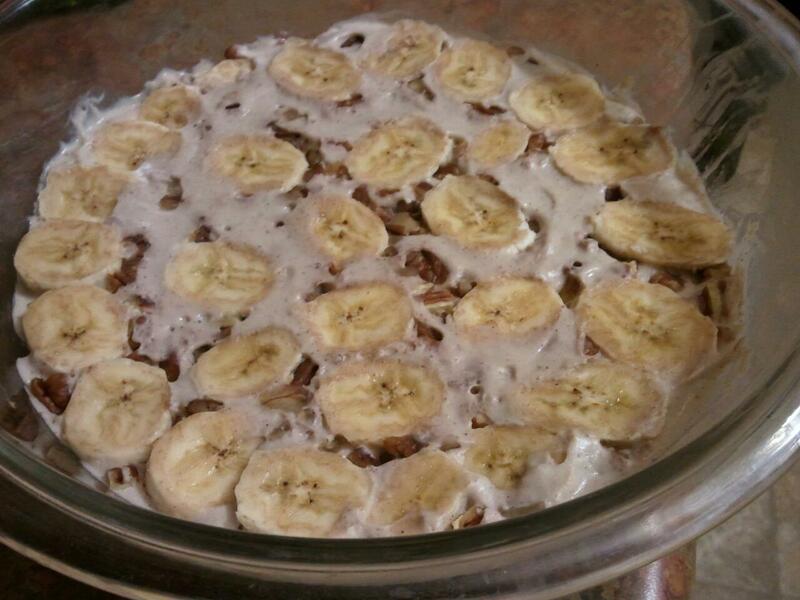 My banana pudding with banana slices and toasted pecans. I’ve made this a couple of times now and love it! In a medium sauce pan over medium heat whisk together the coconut milk, egg yolks, and vanilla until the mixture is hot and starts to thicken like a custard. After it’s thickened a bit, remove from heat and set aside. In a small skillet, heat the coconut oil. Once hot, add the bananas and then add the cinnamon and mix together as the mashed banana fries in the oil. Cook until the banana caramelizes. Add the caramelized banana mixture and oil into the thickened coconut milk mixture and then whisk together to make the pudding. For an even smoother pudding, if some banana chunks remain, you can put the mixture into a food processor or blender. Pour the warm pudding into a bowl or pie dish and cover with plastic wrap, pushing the wrap all the way to the top of the pudding surface to remove any air bubbles. This will ensure that as the pudding cools it does not form a filmy layer on top. Let cool for several hours. Garnish with banana slices and NOM NOM! If you need to speed up the ripening process, put the bananas in a paper bag with an apple or two. Seal up the bag and let them sit in there for 24 hours. This sometimes help speed things up. If that doesn’t work and you can’t wait any longer, heat your over to 450 and bake the bananas until their peels start to get really brown. This won’t ripen the bananas but will have a similar effect to their flavor in the finished dish. Freeze the pudding to make a sort-of banana coconut ice cream. Yum! Toast pecans and use them as a garnish and/or textural addition. Really good! Use your favorite Paleo pie crust recipe. Here’s one: http://paleofood.com/pies.htm#crusts. Make the crust and then pour the pudding in, let cool, and you’ve got yourself a Paleo Banana Cream Pie. Any way I will be subscribing to your augment and even I achievement you get admission to constantly fast. hi! what is the size of the coconut milk can?